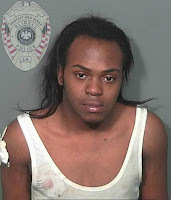 A Slidell woman is being credited with subduing a man who forced his way into her home on Carey Street late Monday (July 24, 2017). Rakeem Ash (23) ran toward the homeowner, punched her in the face several times, and forced his way into the home. The woman armed herself with a wooden club and began to strike Ash until he was subdued. Slidell Police arrived and found Ash acting very excited and apparently under the influence of narcotics, according to their report. He was taken into custody, transported to a nearby hospital, and then booked into the Slidell jail on the charges of Home Invasion and Simple Battery. The suspect told officers he didn't remember the incident but admitted to taking drugs earlier.